A local group is working toward creating a permanent and "visible legacy" in honor of barbed wire baron Jacob Haish. DeKalb Area Agricultural Heritage Association, or DAAHA, is raising funds to place a historical marker outside of the DeKalb Public Library, 309 Oak Street. The marker will detail Haish's life and honor his many contributions to DeKalb. The DeKalb Public Library board recently approved the location of the marker, which will be placed just outside the original entrance to the library, or as some know it, the entrance to the Haish Memorial Library. Haish's will left $150,000 to the city for the construction of the library, which was completed in 1930. With library approval and a proposed text already written with help from Haish family descendant Jeff Marshall, just one more crucial element is needed: the funds to pay for the marker. The total cost of the marker is estimated at $4,200, said Larry Mix, member of the DAAHA historical marker subcommittee. Just $500 has been raised as of January, and in order to install the marker by their goal of June of this year, the majority of funds will need to be raised by April, Mix said. Mix hopes both relatives and fans of Haish's story will donate and help preserve the history of a man who did so much for not only the city of DeKalb, but much of the world, because of his barbed wire and farming implement creations. "Having this marker [outside of the library] is a great opportunity," Mix said. "So many people walk in and out, and may not know who Jacob Haish was. I really think people would be interested to know why he was so important." For more information on DAAHA visit DAAHA.org. 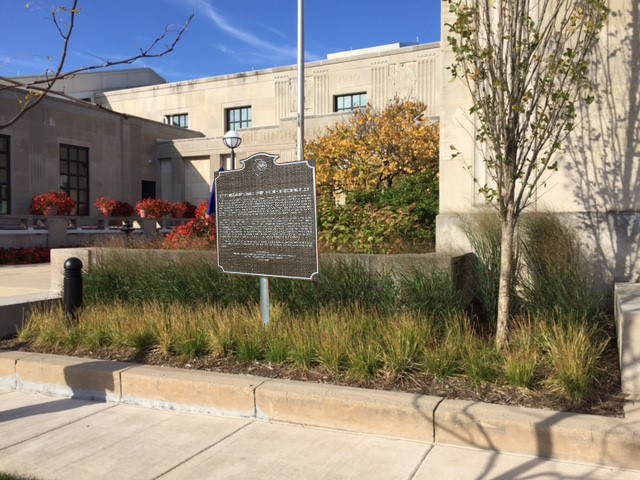 Below is the proposed text for the marker, which is pending approval by the Illinois State Historical Society. Known for his inventive genius, eccentric personality and generous philanthropy, Jacob Haish is perhaps most remembered as an inventor of barbed wire. Born in Germany, he immigrated to this country in 1832 and came to DeKalb County in the 1840’s. As a lumber merchant and builder, Haish learned about the West’s need for cheap, durable fencing to safeguard against livestock that roamed freely, destroying crops. At the DeKalb County Fair in 1873 he noticed a patented wooden fence design with sharp metal barbs. From this, Haish got the idea to make wire barbs and place them on wire that could be stretched between fence posts. A patent was later issued August 31, 1875 on Haish’s design, called “S” barbed wire. Haish started manufacturing S barbed wire in 1874 and in 1881 he erected a two-story factory where one hundred men produced thirty tons of barbed wire a day, later using automatic machinery to manufacture the wire. Other ventures included manufacturing of woven fencing, manure spreaders, cream separators and other farm implements. Between 1892 and 1895 Haish partnered with his barbed wire rivals Isaac Ellwood and Joseph Glidden to bring the Northern Illinois State Normal School to DeKalb, donating $14,000 for the school’s library. Haish’s will directed much of his estate to the betterment of the community he loved, including $150,000 for the construction of the DeKalb Public (Haish Memorial) Library. The building was placed on the National Register of Historic Places in 1980. Any news about the library marker? Did they raise enough funds to put it up? I'm very excited that they are going to put one there!